How different are the costs and consequences of delayed versus immediate HIV treatment? A recent major report, commissioned by the South African Government, examines alternative long-term scenarios for the costs and benefits of HIV prevention and treatment, and care for orphans and others affected by AIDS in South Africa.1 Not considered by the report is what one might call 'treatment-centred prevention' (TcP), by which we mean a combination of regular testing for HIV, immediate highly active antiretroviral therapy (HAART) offered to all infected individuals, and other proven HIV prevention methods. Such an approach could dramatically reduce infectiousness of HIV-positive people, leading to critical reductions in the rate of new infections. But is there really such a big difference in the ultimate costs between the TcP approach and current strategies where people can be treated only when they have sufficiently advanced disease? Few would dispute that infected individuals should start treatment before they are at substantial risk of death, but also before undue morbidity and associated health care costs are incurred as a result of untreated HIV infection. 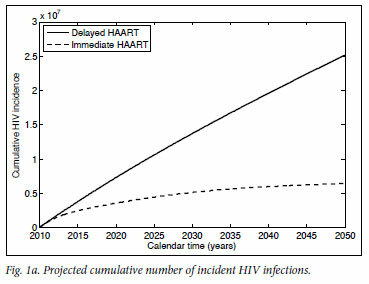 Any defensible treatment plan therefore already aims to offer HIV care and support to the majority of those infected, for the period of remaining post-treatment life expectancy - possibly several decades.16,17 Hence, the ultimate cost difference between treating people very soon after infection versus 5 or so years later, is then not a large proportion of the total treatment cost of TcP. Mathematical model projections for scenarios of immediate versus delayed HAART initiation support the intuitive statements on the comparable costs and diverging effects of these alternative treatment strategies (Fig. 1). 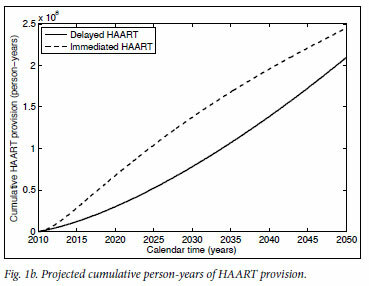 For the first 10 years of TcP, the cumulative number of person-years on HAART would be about double of what we expect under the current treatment policy. 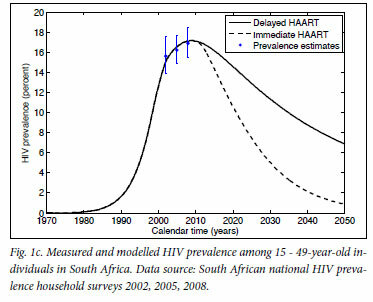 Lower HIV incidence rates under TcP would result in a decreasing need for HAART initiation, in contrast to the sustained pool of people in need of HIV treatment if treatment remains delayed until several years after infection (cf. Figs 1a, 1b). 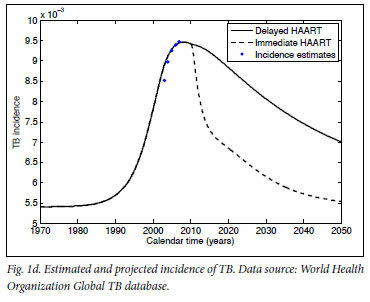 A substantially reduced HIV prevalence under TcP, in combination with the protective effect of HAART on TB, explains why TcP could have a large influence on the incidence of TB (Figs 1c, 1d). In conclusion: regardless of our approach to treatment, we are inevitably faced with the problem of funding and administering a treatment programme of unprecedented size, complexity and cost for decades to come. If the indirect costs to society of HIV-related morbidity and mortality are taken into account as well,22,23 deferred HAART initiation becomes the more expensive rather than the cheaper option. The important point is that the current treatment policy does little to reduce the rate of new infections, but does ensure that people are sicker, and require more medical attention and expenditure, when they start treatment. TcP is one of the few credible plans to turn off the tap of new infections, providing real hope that we can reduce the HIV epidemic to negligible levels. The choice that South Africa faces is not between spending much more or considerably less money on HIV treatment - it is about attempting to eradicate HIV over the next two generations, or accepting endemic levels of HIV infection, quite probably for many more generations. Tienie Stander is the CEO of heXor (Health Econometrix and Outcomes Research), Midrand, Gauteng.